You can order your cake with a variety of fillings, and seasonal cakes are available for holidays and other occasions. 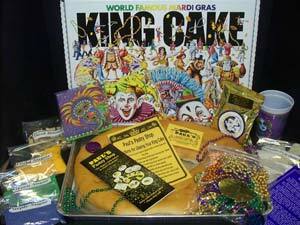 Each cake is shipped with sugar and glaze decorating packets, one Mardi Gras cup, two strands of beads, two doubloons, and a king cake baby baked inside. Extra souvenirs may be purchased separately. Recipients of our King Cakes experience the ultimate in freshness by participating in the decorating fun! When your King Cake arrives, you will have the experience of glazing and decorating it yourself–adding just as much glaze, sliced almonds, and sugars as you like. If not using your King Cake upon arrival, please refrigerate or freeze BEFORE decorating. Take the cake out to thaw on morning of serving and enjoy! If you select “Requested Delivery Date” of Mardi Gras Day, Tuesday March 5, you MUST select Next Day Saver or Next Day Priority. If you do not select one of those 2 services, your credit card will be billed for the additional shipping charges for the overnight service. (MS & LA are the only states that can select Ground Service). Our New mixed filling of Cream Cheese, Raspberry, Amaretto, & Sliced Almonds topped with an Almond Glaze and Candied Sliced Almonds. Our New mixed filling of Cream Cheese, Coconut Flake & Pecan Pieces topped with Cream Cheese Glaze, Coconut & Toasted Pecans. A delicious combination of chocolate, coconut & pecans.